This article is about the early 20th-century Montenegrin state. For the WWII state sometimes called the Kingdom of Montenegro, see Italian governorate of Montenegro. The Kingdom of Montenegro (Serbian: Краљевина Црнa Горa / Kraljevina Crna Gora) was a monarchy in southeastern Europe, present-day Montenegro, during the tumultuous years on the Balkan Peninsula leading up to and during World War I. Legally it was a constitutional monarchy, but absolutist in practice. On 28 November 1918, following the end of World War I, with the Montenegrin government still in exile, the Podgorica Assembly proclaimed unification with the Kingdom of Serbia which itself was merged into the Kingdom of Serbs, Croats and Slovenes three days later, on 1 December 1918. Prince Nicholas of Montenegro proclaimed the Kingdom of Montenegro in Cetinje on 28 August 1910, elevating the country from the rank of Principality. King Nicholas I had ruled the country as Prince since 1860, and had initiated several modernising reforms at the beginning of the 20th century, such as introducing a constitution and a new currency, the Montenegrin perper. Montenegro joined the First Balkan War in 1912, hoping to win a share in the last Ottoman-controlled areas of Rumelia. Montenegro did make further territorial gains by splitting Sandžak with Serbia on 30 May 1913. But the Montenegrins had to abandon the newly captured city of İşkodra (Skadar in Serbian, modern-day Shkodër) to the new state of Albania in May 1913, at the insistence of the Great Powers, despite the Montenegrins having invested 10,000 lives into the capture of the town (April 1913) from the Ottoman-Albanian forces of Esad Pasha. Essad Pasha made a deal to surrender the town to the Montenegrins in exchange for Montenegro supporting his claims in Central Albania. However, as Shkodër and the surroundings had a large ethnic Albanian majority, the area went to the state of Albania instead. When the Second Balkan War broke out in June 1913, Serbia fought against Bulgaria, and King Nicholas sided with Serbia. During World War I (1914–1918) Montenegro allied itself with the Triple Entente, in line with King Nicholas' pro-Serbian policy. 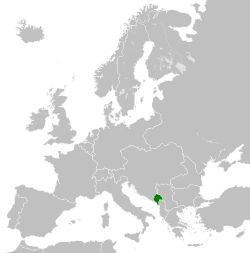 Accordingly, Austria-Hungary occupied Montenegro from 15 January 1916 to October 1918. On 20 July 1917, the signing of the Corfu Declaration foreshadowed the unification of Montenegro with Serbia. On 26 November 1918, Podgorica Assembly, an elected body claiming to represent Montenegrin people, unanimously adopted a resolution deposing king Nicholas I (who was still in exile) and unifying Montenegro with Serbia. Upon this event Nicholas I, who had previously supported unification with Serbia into a greater state with his dynasty playing the pivotal role, switched to promoting Montenegrin nationalism and opposing the union with Serbia, a position he maintained until his death in France in 1921. On 1 December 1918, the Kingdom of Yugoslavia was created, where both Serbia and Montenegro were parts. During World War II, the occupying forces in Yugoslavia considered turning the Italian governorate of Montenegro into a puppet kingdom, but nothing came of these plans. Kingdom of Montenegro in 1913. Proclamation of the Kingdom of Montenegro, 28 August 1910. ^ Constitution of the Principality of Montenegro, 1905, Article 40, "Paragraph 1: State religion in Montenegro is Eastern-Orthodox. Paragraph 2: Montenegrin Church is Autocephalous. It is independent from any other Church, but maintains dogmatic unity with Eastern-Orthodox Ecumenical Church. Paragraph 3: All other recognized religions are free in Montenegro.